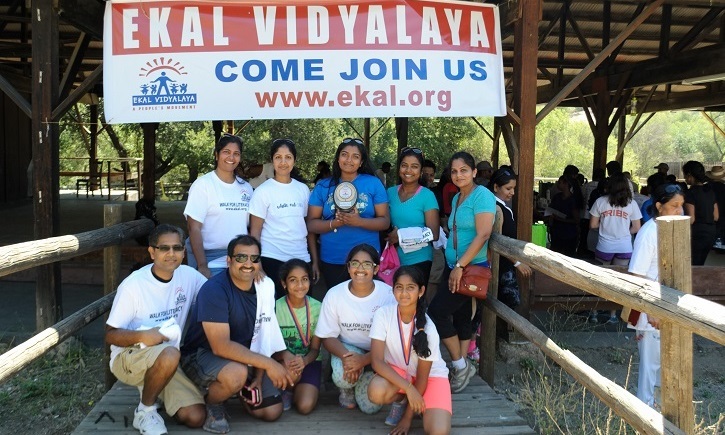 Ekal Vidyalaya Foundation‘s North LA & Tri-Valley Chapter held its annual ‘Literacy Walk’ (walk / jog-a-thon event) at the scenic Paramount Ranch Trail in Agoura Hills, CA on Saturday, July 25, 2015. The event took place under picture- perfect sunny skies and warm, invigorating weather. The Literacy Walk attracted a record crowd of over 130 participants of all ages, young and old alike. The event started with a healthy breakfast of both Indian and American fare, provided by sponsors and volunteers. The 5k Jog began promptly at 8:30 AM. The walkers enjoyed a more leisurely start – with a yoga session focusing on warming up, stretching and breathing techniques conducted by instructors from Yoga Bharathi, before participants commenced walking at 9 AM. The ‘Literacy Walk’ will benefit underprivileged children living in Indian rural villages, who lack access to schools and educational institutions. Ekal Vidyalaya is an organization which sets up free schools and provides teacher and school supplies for children in such villages. In addition to its focus on primary education in these villages, Ekal Vidyalaya provides the villagers with health awareness education and vocational training to ensure self- sufficiency and sustenance. It only takes $365 to run an Ekal – sponsored school for an entire year ($1/Day). Ekal Vidyalaya operates on a shoe-string budget; it ensures that over 90% of the donations reach the cause, and keeps administrative costs below 10%. The ‘Literacy Walk’ also incorporated learning into its trail. 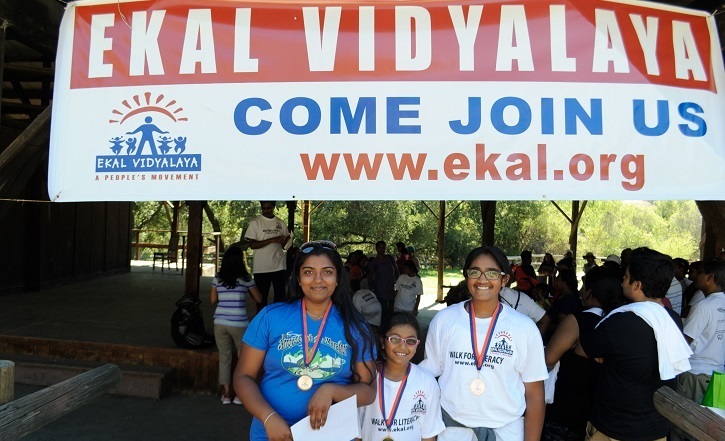 Participants learned about Ekal and its mission while they walked and jogged; posters, signs, and stations on the track informed participants about what the organization does to remove illiteracy from rural and tribal villages. Many participants were quite surprised to learn that there were over 50,000 Ekal schools running in as many villages below the Indian poverty line. Ekal currently educates over 1.5 million children. At the end of the trail, children were quizzed on what they learned. Notably, most of the planning for the walk/jog was done by the youth volunteers. Nevertheless, the event ran smoothly from start to finish. 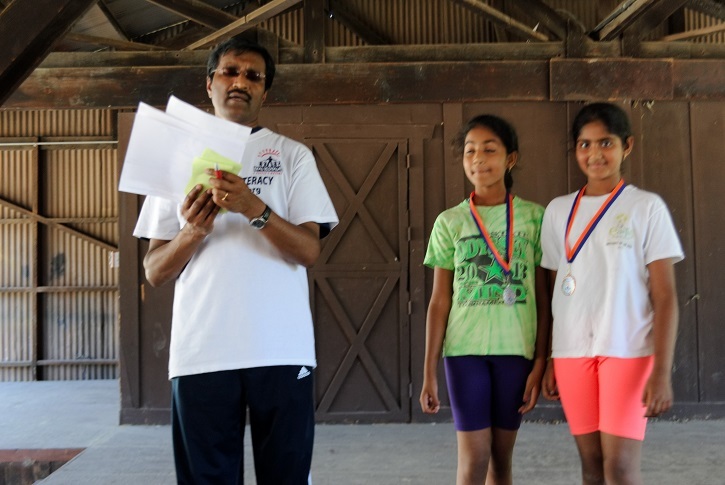 The event concluded with an award ceremony where the top three performers on the jog/quiz event were recognized. Team trophies were presented to teams that had maximum participation. Overall, the participants left understanding the cause they were supporting. Participants seemed to enjoy themselves throughout the event, and many expressed that they were looking forward to similar events in the community in the near future. 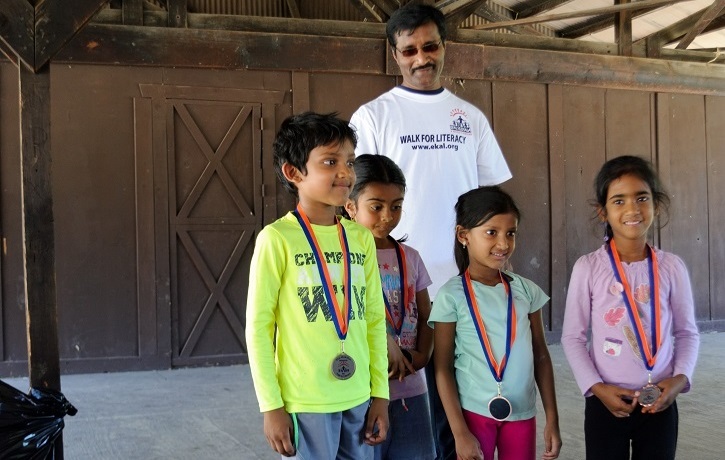 “This is our fourth season hosting this walkathon, and every year we’ve not only accomplished our fundraising goals, but also continued to increase participation. However, this year was exceptional, with an overwhelming response from the community. The event raised enough funds to support more than 10 Ekal schools” said Narayan Pallavur, President of the Ekal Chapter. Ekal Vidyalaya operates one teacher schools in rural and tribal villages of India and neighboring countries. The goal of the organization is to eradicate illiteracy from these villages, where current literacy rates are in single digits. The movement has seen significant improvement in literacy rates and overall village development after the establishment of such schools, as ascertained by studies by reputed research organizations.